All this snow and cold weather is depressing so I figure adding color to my wardrobe and getting a head start on spring shopping is a guaranteed way to cheer up. 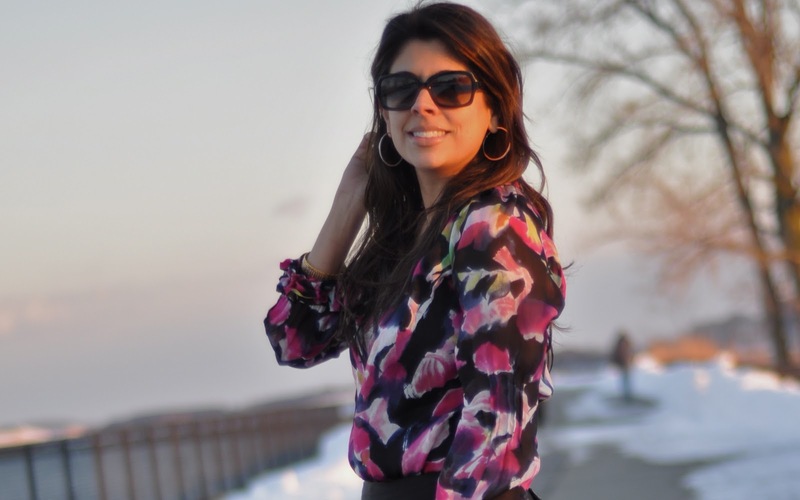 I found this colorful floral DVF blouse hidden on the sale rack at Saks and it's perfect because bold prints and bright colors are two trends I am really looking forward to embracing this spring and summer. We had a great weekend but as usual it went by entirely too fast. On Saturday I spent most of the day in my pajamas and baked some delicious treats with Ariyana. And then Aneesh and I had dinner with our friends to celebrate their recent engagement. Yesterday we promised Ariyana we would take her out wherever she wanted and she insisted on going back to the Museum of Fine Arts. We also had brunch with some friends at Stella, one of our favorite restaurants in Boston. Stella was participating in the Super Hungry Brunch, an annual event where top restaurants around town donate their time, food, and services to the benefit of the Greater Boston Food Bank. We had a prix fixe brunch and 100% of the proceeds went directly to the Food Bank.